During the Asuka period(AD538-710) Gokishichido(five provinces and seven circuits) was organized as part of the legal and government system. 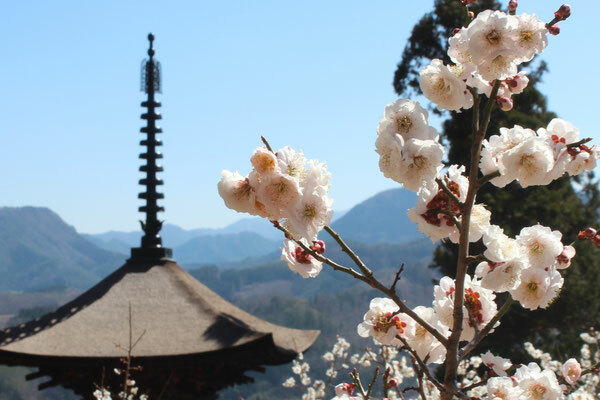 Tosando(eastern mountain circuit) is one of Gokishichido and consisted of some provinces in the central mountain of northern Japan. 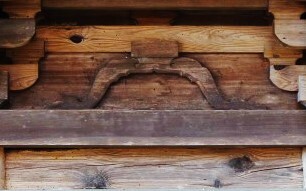 The main road running through Tosando was also called Tosando-road. Tosando-road had Umaya(horse station) each 16 km. 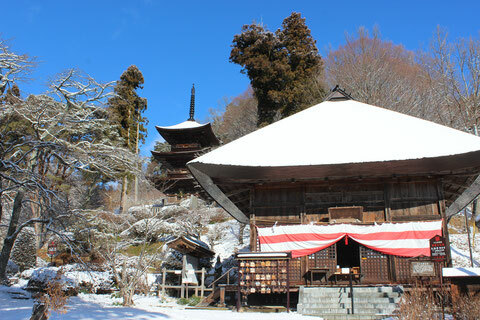 Urano was one of the Umaya and located in the center of Shinano(Nagano prefecture). Daihouji-temple is thought to be established as the temple for Urano Umaya. Since Urano Umaya was set, the area around Daihouji-temple prospered as a place of military importance, because many horses were bred there. 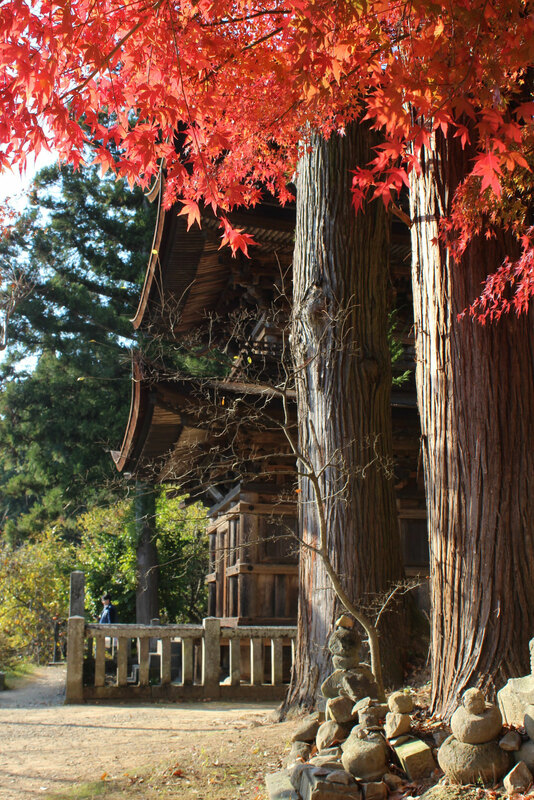 Daihouji-temple was the center of Buddhist belief for people in the area and they presented many cultural properties such as Three-storied-pagoda to Daihouji-temple. 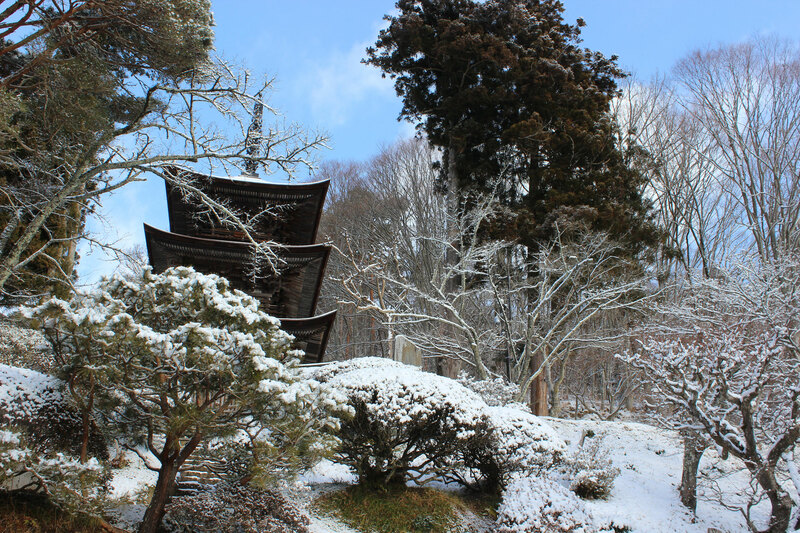 Daihou-ji Temple on January 1st. The origin of Pagoda was Stupa in ancient India. Stupa were used as commemorative monuments and sacred relics could be kept safe and venerated in Stupa. The architectural structure of Stupa spread across Asia from India. 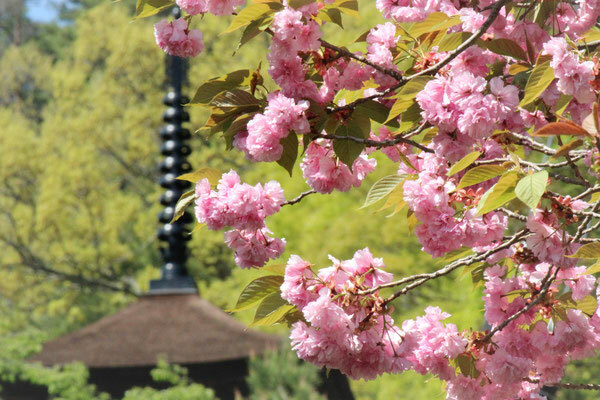 Stupa introduced to Japan had Chinese-tower architecture style and originally developed to the existing style. 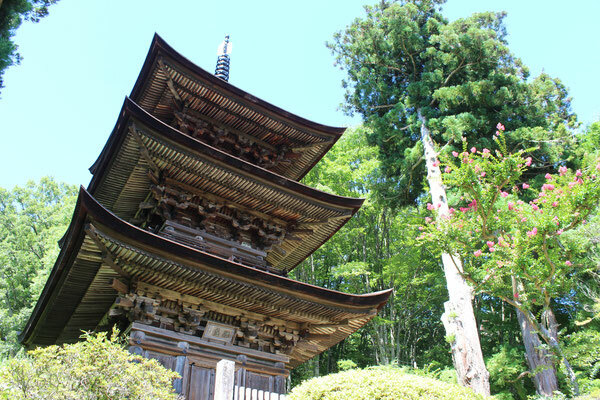 The three-story pagoda in Daihoj-templei was constructed in 1333. It is thought that some powerful samurai donated this pagoda as a symbol of their tombs. 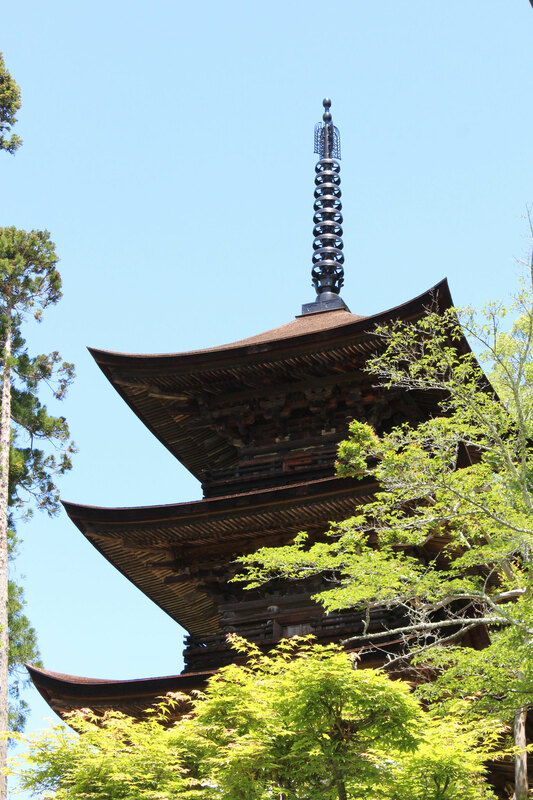 The head carpenter, who was invited from Tennouji-temple in Osaka, built this pagoda in the cutting edge Japanese architectural style at that time. This pagoda uses no nails and is roofed with Japanese-cypress-bark shingles. 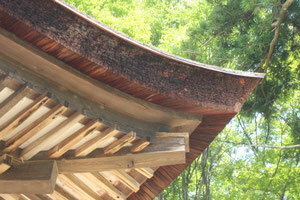 Kaerumata(wooden supports for roof) and distinctive lattice patterns also preserve the pure Japanese style. The pagoda came to be known as the "Looking Back Pagoda", because it is so beautiful that people leaving the temple can't help turning around to have a last look at the pagoda. 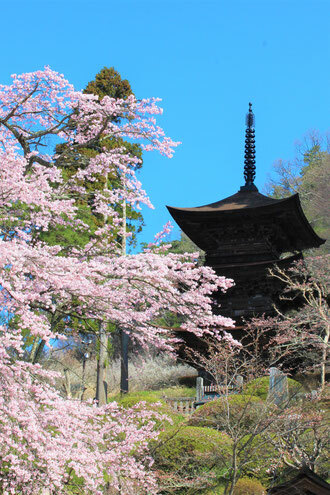 Daihou-ji Temple three story pagoda in spring. 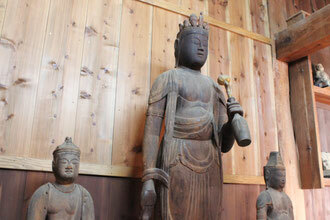 Kannon(Avalokiteshvara) is goddess of mercy and compassion and one of the most popular figure in Buddhist legend. Kannon is not a Buddha but she or he is able to achive Nirvana but delays doing so to help suffering people. Juichimen Kannon(Eleven-faced Kannnon) has eleven additional small heads atop her own face. The many faces, eyes and ears represent variety of ways Kannon can see, hear and benefit all beings. Like many other Juichmen Kannon in Japan that in Daihou-ji Temple was also carved in the Heian period and that is the oldest Buddhism figure around Ueda area. She or he was made from a single block of wood. The merciful expression on her face is feature of this statue.